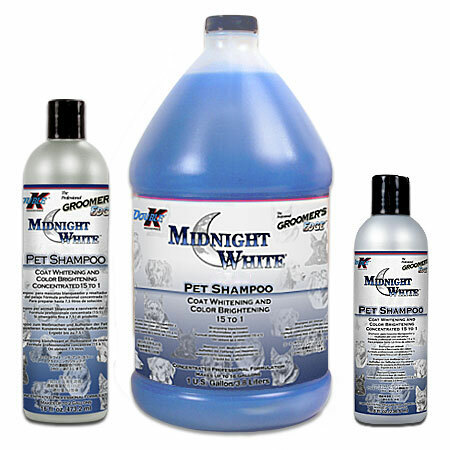 MIDNIGHT WHITE™ professional shampoo cleans, conditions and brightens white coats and enhances colored coats. Removes stains and odors. Leaves hair lustrous and healthy with a fresh clean scent! pH balanced especially for animals. The unique formula of MIDNIGHT WHITE™ with Aloe, Panthenol and Vitamin E gently cleans, while maintaining the natural moisture balance in both skin and hair. Great for dogs, cats, puppies, kittens and all companion and farm animals.